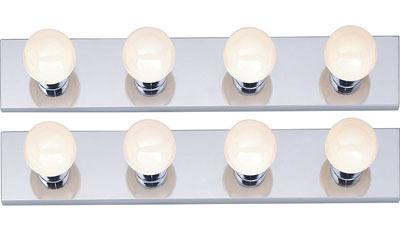 Well, you can create Hollywood style vanity in your bathroom with this Nuvo Four Light Vanity Strip. Featuring polished chrome frame with blue protective cover, you can install four strips to surround the mirror, creating a cool bathroom/makeup mirror just like that belongs to movie stars. We highly recommend that you install all four strips to perfect the appearance, but some people say that one on each side and one on top is enough. It’s your choice, just do trial and error to find the perfect arrangement. 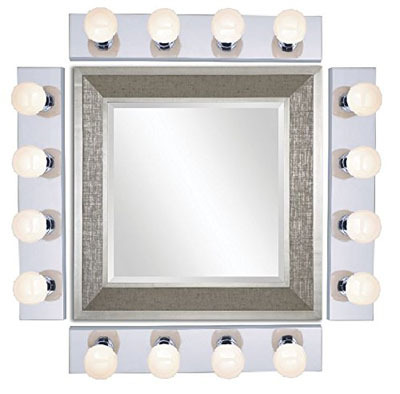 This light fixture requires four 100-watt G medium base bulbs, which are not included. You need to do some installations, it requires some drilling and electrical wiring, don’t do it by yourself if you don’t know how, we recommend that you hire a professional to do it. 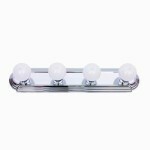 Many customers love the look of it, a set of light vanity strip would definitely bright up your make up room or bathroom mirror. Where to buy Nuvo Four Light Vanity Strip? 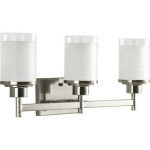 This entry was posted in Bathroom Lights by Bathroom Fixtures Reviews. Bookmark the permalink. Love this product? Please share it! 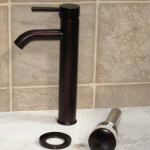 Pros and Cons : Should I Use Single or Two Handle Faucet? BathroomTicker is a online reviews dedicated to retro, contemporary to modern bathroom fixtures and accessories information. It covers many bathroom fixtures and aims to be the place where you can discover unique and interesting bathroom products. Copyright © 2019 Bathroom Fixtures Reviews. All Right Reserved. Entries (RSS).